The Bio-Oxygen advanced facial rejuvenation technology product line includes natural ingredients to promote tissue regeneration, essential protection from environmental hazards and intense hydration vital for radiant skin. Q. What is BioGold ? BioGold is bio-degradable gold that is enriching to delicate skin. It reduces the damaging effects of free radicals. It strengthens the skin by cross-binding the collagen. It has a fast absorption rate due to its small molecular mass. Bio-Gold is anti-allergenic and anti-inflammatory. It is 100% natural and environmentally friendly. It contains no colorants. The colour is a result of the active ingredient. Biogold Facial Treatment combines the benefits of a diamond tip microdermabrasion and the application of a natural mask. The skin gets renovated by means of a delicate exfoliation and a powerful revitalization. Rejuvenate our skin and recover your face freshness. Q. How is Biogold facial treatment performed ? The treatment begins with a deep cleansing of the skin in a comfortable atmosphere with delightful natural scents. The specialist will apply an exfoliating cream, she will remove it later and dry the skin with delicate and gentle movements. 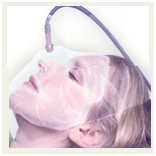 Once the skin is completely clean and dry, the diamond tip microdermabrasion treatment begins. The professional will work on all the areas of the face using tips of different sizes performing a superficial to deep mechanical peel. This removes all the dead cells, which will be replaced in a few days by stronger and healthier cells. It also stimulates the connective tissues, giving damaged, stained or aged skin a much better appearance. Finally, the specialist will apply a Bio-gold mask made of active substances in dynamic association derived from completely natural products such as soy peptides and protein, oligoelements, wheatgerm and primrose oil, cocoa milk and moisturizing compounds with pleasant herbal scents. Your skin will be deeply moisturized and will recover tonicity and elasticity.